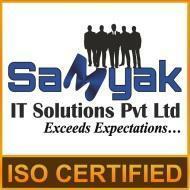 We are registered in USA & India, Samyak IT Solutions Pvt Ltd is the best institution to take Practical & Job oriented training. The faculties in Samyak are from corporate & various prestigious industries across India. 11. 10 Branches & Growing. 12. Most Preferred Vendor working on Projects. "Superb Quality, Good Culture, Wonderful Faculty & Excellent Infrastructure. I highly recommend Samyak classes and would suggest everyone to visit once. They also provide international certifications. " Samyak Computer Classes - 11 Branches conducts classes in 3D Studio Max, Adobe Certification and Adobe Photoshop Training. It is located in Bani Park, Jaipur. It takes Regular Classes- at the Institute. It has got 1 reviews till now with 100% positive feedback.